Last year, when I had a close call with death (please refer to: Near Death at the Hospital, Last Month! – Back in Humor, This Month!) I realized that I needed to start doing the things in my life that I have been dreaming about. 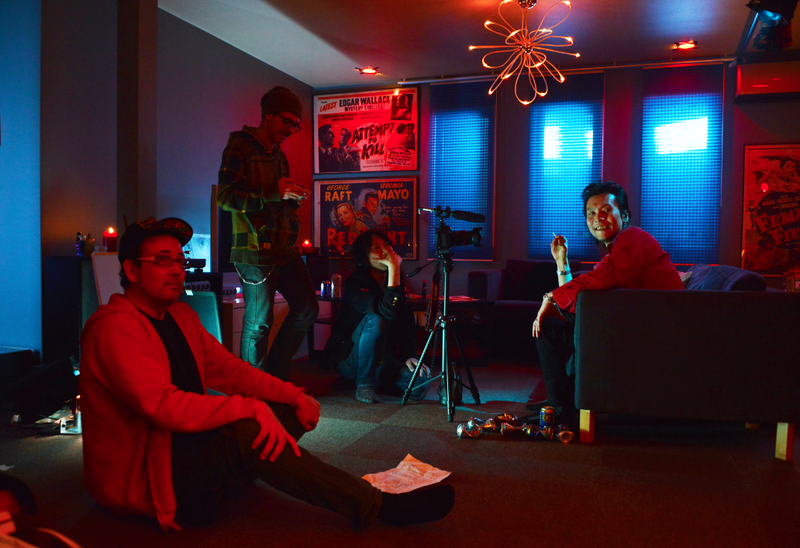 So, I decided that I had to get my talented friends together and make a short feature film. I think there is a chance for us to build a Rock & Roll Cult movement that is famous around the world between now and the 2020 Olympics. I want to be in the center of that movement. The movement involves Japanese culture, past and present, rock and roll music and animation. To make things easier to grasp, I think it might be good to tell you, dear reader, the 4 key words (images) that I always want to keep in mind for all the films and projects we make: 1) 1950s Science Fiction, 2) Rock and Roll, 3) Horror/Ghost movies, 4) Tarantino. I think if I can keep my mind, and my staff’s mind, on these images, then we will succeed in making the kinds of things that will be perfect to put 2015 ~ 2020 Tokyo into the minds of the fans of cult films and music… Because the Olympics and big money cash-ins amongst the politically well connected ARE NOT what we, nor Japanese people are about… At least I hope so. Our story is about a struggling Rock and Roll musician who finds the tortured spirit of an old blues musician living in his studio. 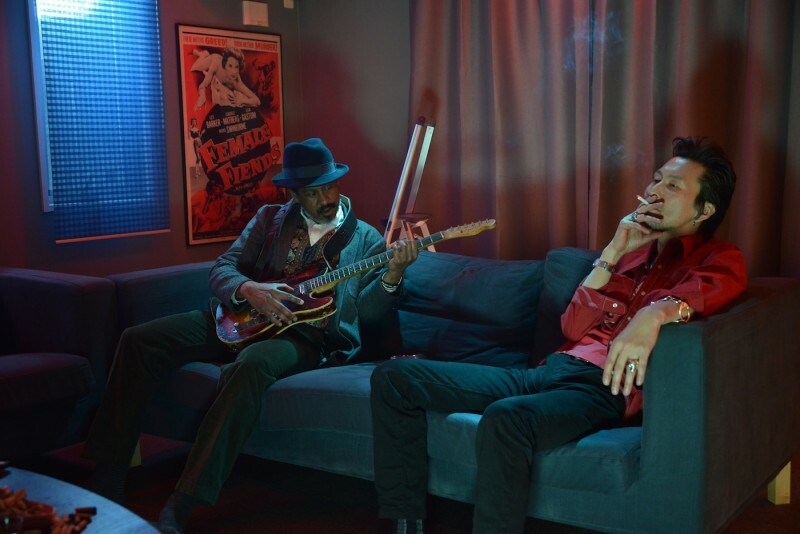 At night, when they are all alone, the two together make music that is unworldly in its brilliance, yet no one can hear it except the struggling rocker and the dead blues musician. It doesn’t have a happy ending… Or does it? I wanted to make this movie on the level of quality of something like Quentin Tarrantino makes. Yes. Laugh now, if you wish; it is a ridiculous goal for us. Ridiculous or not, that is the heights we aim for. I think “Julie – Johnny Guitar” captures the essence of what we want to accomplish in the Rock & Roll Ghost Story: A Tarantino style full of cinematic allusions and pop culture references. 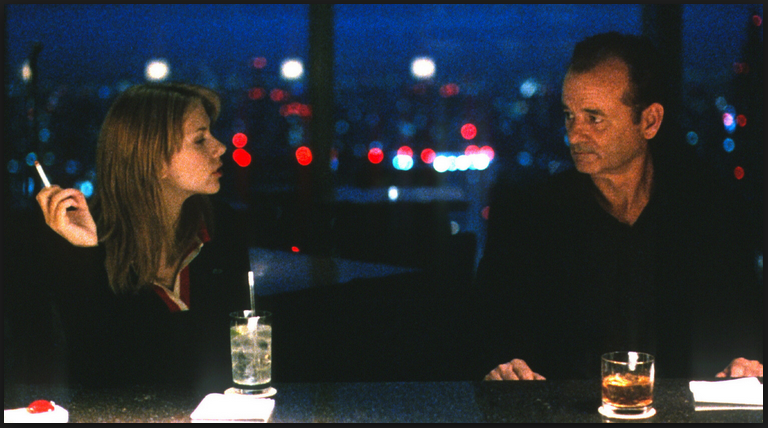 Oh, yeah, I guess I should also mention that Yuji Wada was the lighting director for many Sophie Coppola films, one of my favorites was the Hollywood smash hit, Lost in Translation starring Bill Murray. The lighting in this scene is the feel of what I want. Yuji is the perfect guy for that. Need proof? Here, below, is a shot from our session on Friday, Jan. 23, 2015. This is EXACTLY what I wanted. Finally, to put it all together, I needed actors who can actually perform and have a strong Rock and Roll image. 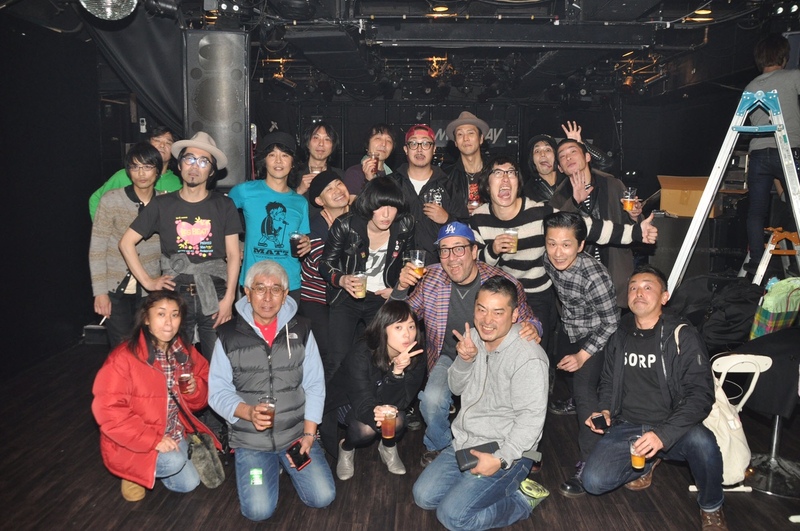 Who better than one of Japan’s best rock and roll bands, “The Neatbeats”? Mr. Pan, lead singer of the Neatbeats, will play the part of our struggling musician. He is the hero, and failure, of our movie. He is the guy sitting on the right of the sofa in the photo above. The guy is just overflowing with Rock and Roll. He’s perfect! Robot55 movie shoot. On stage is the Privates. Table in front is Furukawa Taro and Tomomi Hiraiwa. Table behind (guy sleeping) is me, Mike Rogers (Brilliant acting, right?) Camera (far right) Enrico Ciccu (Director). 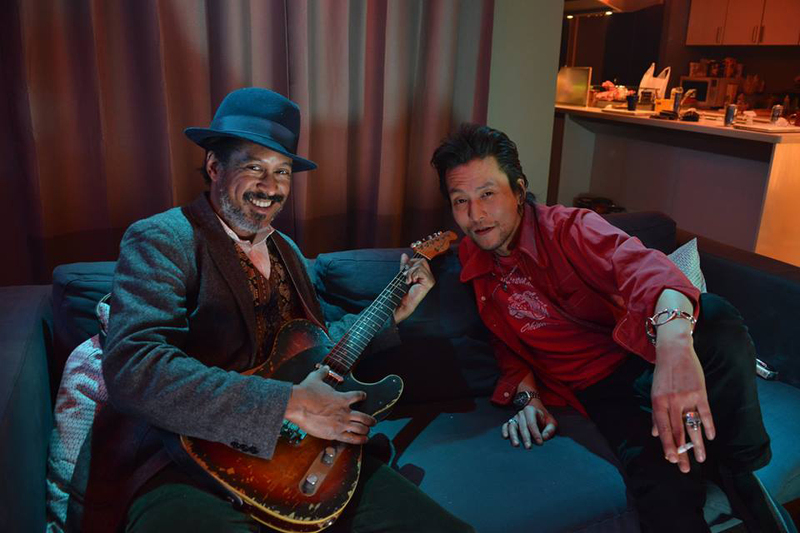 Photo by Arai Osamu. The editing for this film starts next week. As we progress, we will post updates. I may be acting dead in this photo, but I am going to die a happy man when this production is finished and it is world-quality and as good as anything Hollywood makes. It is one thing, a first of many, that all of us; Ken Nishikawa, Enrico Ciccu and me, have dreamt about all our lives. 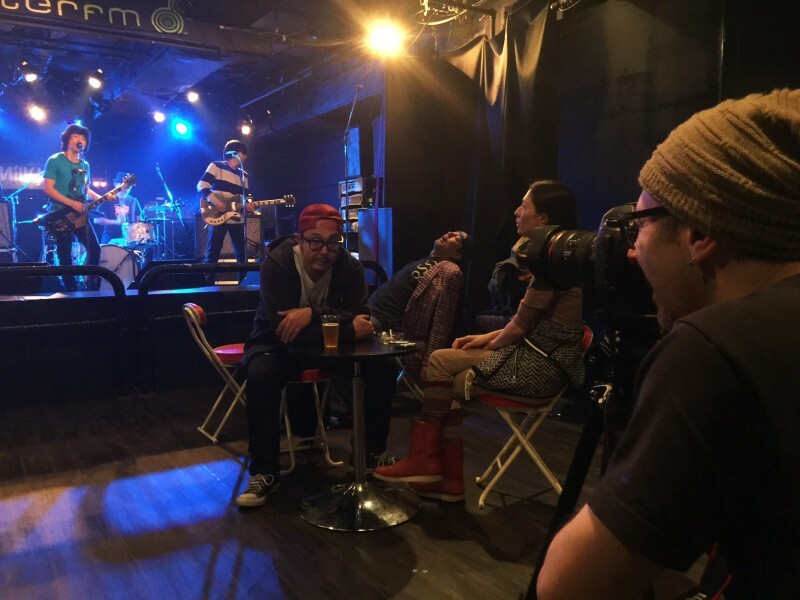 There is also a boom of English language videos and productions coming to Japan and Robot55 aims to be a key player in making viral videos for the foreign market that comes to Japan. Why not? We have people who live and work professionally in this market in TV and video production as well as guys who have made many commercials and smash hit (and cult) TV and radio shows. I am confident that there is no other company in Japan who can touch us for that market; making viral videos in English for the foreigners coming to Japan for the Tokyo Olympics. There is a cult and cutlure boom coming to Japan in the next 5 years. ロックンロール・ルネッサンス！ / Rock ‘n’ Roll Renaissance!